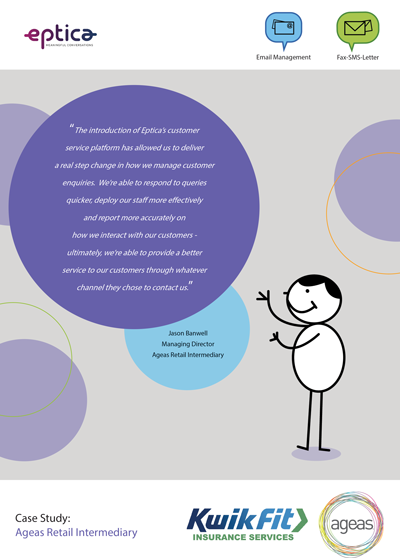 Ageas Retail Intermediary | Eptica - Multi Channel Customer Interaction Software. Email Management. Web Self-service. Live Chat and Agent Knowledgebase. Part of Ageas UK, a leading provider of awarding-winning insurance solutions, Ageas Retail Intermediary (ARI) operates as an insurance intermediary within the personal lines insurance market. A key ARI brand is Kwik-Fit Insurance Services (KFIS) which is based in Glasgow and operates a large scale contact centre providing sales and service support including more than 275,000 written communications (email, web forms and white mail) each year.